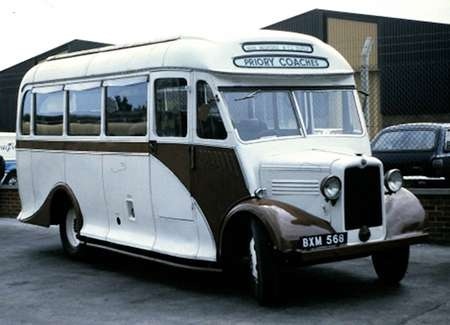 Here we have a Bedford WTL with Duple C20F bodywork from 1935. She is seen in the livery of Cyril Cowdray (Priory Coaches) of Gosport, another operator put off the road after upsetting the Traffic Commissioner once too often. She was new to Blunt, Mitcham, and spent some time on the Isle Of Man as CMN 986 before returning to the UK. The scene is an Open Day at the Provincial depot, Hoeford, on 8 June 1985. This coach has been with J. W. Lodge & Sons of High Easter for some years undergoing a thorough rebuild however I think it was put to one side while they were restoring their Ford T. I believe that their ultimate aim is to have a representative vehicle from each decade that the company has been operating. Since they are well in to their tenth decade that’s quite a fleet of historic vehicles! Thank you, Nigel. Yes, it will be a VERY impressive collection when they decide that it’s complete. "Now, have we room in the garage for another OB?"